X Its slick black skin is thin and damp. A part of its internal organs can be seen through the skin as a spiral pattern. X Sa peau est humide, lisse et surtout très fine. La forme en spirale sur son ventre est en fait une partie de ses organes internes que l’on peut apercevoir. X Tiene una piel extraordinaria, fina y húmeda, que deja entrever las vísceras que tiene dispuestas en espiral. X Dalla pelle nera, lucida, umida e sottile si intravedono gli organi interni, che formano una spirale. X 매끄럽고 검은 피부는 얇고 축축하다. 내장 일부가 비쳐서 소용돌이 모양으로 보인다. Y The direction of the spiral on the belly differs by area. It is more adept at swimming than walking. Y La dirección de la espiral en el vientre cambia según el área. Prefiere nadar a correr. Y La spirale che ha sulla pancia varia da zona a zona. È molto più bravo nel nuoto che nella corsa. Y 배의 소용돌이 방향은 태어난 지방에 따라 다른 듯하다. 걷기보다 헤엄치기를 잘한다. 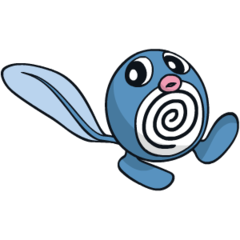 Omega Ruby Poliwag has a very thin skin. It is possible to see the Pokémon’s spiral innards right through the skin. Despite its thinness, however, the skin is also very flexible. Even sharp fangs bounce right off it. Omega Ruby Quapsel hat eine sehr dünne Haut. Durch sie hindurch kann man sogar sein spiralförmiges Inneres sehen. Obwohl seine Haut so dünn ist, ist sie sehr elastisch. Selbst scharfe Reißzähne können sie nicht durchdringen. Omega Ruby Ptitard a une peau très fine. On peut même voir les entrailles en spirale de ce Pokémon à travers sa peau. Malgré sa finesse, cette peau est aussi très élastique. Même les crocs les plus acérés rebondissent dessus. Omega Ruby Poliwag tiene una piel muy fina. Tanto que es posible entrever a través de la misma las vísceras en espiral que tiene. La piel, aunque fina, tiene la ventaja de ser flexible y hacer rebotar hasta los colmillos más afilados. 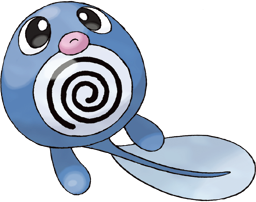 Omega Ruby Poliwag ha una pelle molto sottile, attraverso cui è possibile intravedere i suoi organi interni spiraliformi. Nonostante il suo esiguo spessore, la pelle è molto elastica. Anche le zanne più affilate non riescono a lacerarla. Omega Ruby 소용돌이 모양인 내장이 비칠 정도로 얇은 피부이지만 날카로운 이빨을 튕겨내는 탄력을 지니고 있다. Alpha Sapphire Poliwag has a very thin skin. It is possible to see the Pokémon’s spiral innards right through the skin. Despite its thinness, however, the skin is also very flexible. Even sharp fangs bounce right off it. Alpha Sapphire Quapsel hat eine sehr dünne Haut. Durch sie hindurch kann man sogar sein spiralförmiges Inneres sehen. Obwohl seine Haut so dünn ist, ist sie sehr elastisch. Selbst scharfe Reißzähne können sie nicht durchdringen. Alpha Sapphire Ptitard a une peau très fine. On peut même voir les entrailles en spirale de ce Pokémon à travers sa peau. Malgré sa finesse, cette peau est aussi très élastique. Même les crocs les plus acérés rebondissent dessus. Alpha Sapphire Poliwag tiene una piel muy fina. Tanto que es posible entrever a través de la misma las vísceras en espiral que tiene. La piel, aunque fina, tiene la ventaja de ser flexible y hacer rebotar hasta los colmillos más afilados. Alpha Sapphire Poliwag ha una pelle molto sottile, attraverso cui è possibile intravedere i suoi organi interni spiraliformi. Nonostante il suo esiguo spessore, la pelle è molto elastica. Anche le zanne più affilate non riescono a lacerarla. Alpha Sapphire 소용돌이 모양인 내장이 비칠 정도로 얇은 피부이지만 날카로운 이빨을 튕겨내는 탄력을 지니고 있다. Sun The swirl on its belly is its internal organs showing through. If the swirl is tinged white, that means it’s affected by some disease. Moon It’s still not very good at walking. Its Trainers should train this Pokémon to walk every day. Red Its newly grown legs prevent it from running. It appears to prefer swimming than trying to stand. Blue Its newly grown legs prevent it from running. It appears to prefer swimming than trying to stand. Yellow The direction of the spiral on the belly differs by area. It is more adept at swimming than walking. Stadium The spiral on its belly is its internal organs seen through its thin skin. It is better at swimming than walking. Gold Because it is inept at walking on its newly grown legs, it always swims around in water. Silver The direction of its belly spiral differs by area. The equator is thought to have an effect on this. Stadium2 Because it is inept at walking on its newly grown legs, it always swims around in water. Ruby Poliwag has a very thin skin. It is possible to see the Pokmeon's spiral innards right through the skin. Despite its thinnes, however, the skin is also very flexible. Even sharp fangs bounce right off it. Sapphire POLIWAG has a very thin skin. It is possible to see the POKeMON's spiral innards right through the skin. Despite its thinness, however, the skin is also very flexible. Even sharp fangs bounce right off it. Emerald It is possible to see this POKeMON's spiral innards right through its thin skin. However, the skin is also very flexible. Even sharp fangs bounce right off it. Pearl Its skin is so thin, its internal organs are visible. It has trouble walking on its newly grown feet. Platinum Its skin is so thin, its internal organs are visible. It has trouble walking on its newly grown feet. Black Its skin is so thin, its internal organs are visible. It has trouble walking on its newly grown feet. White Its skin is so thin, its internal organs are visible. It has trouble walking on its newly grown feet. White 2 Its skin is so thin, its internal organs are visible. It has trouble walking on its newly grown feet.